The Castleknock player suffered a season-ending injury last month against Kildare. 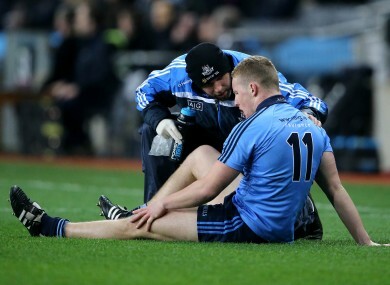 Dublin's Ciaran Kilkenny after injuring his cruciate against Kildare. DUBLIN CRUCIATE VICTIMS Ciaran Kilkenny and Kevin O’Brien will solider along side each other during their rehabilitation from the season-ending injuries after both players underwent operations recently. Kilkenny saw his season grind to a halt last month after suffering the serious injury to his left knee in a league tie against Kildare. O’Brien is in the same boat after rupturing his cruciate back in February while in Sigerson Cup action for Dublin IT. The pair are set to use each other as sounding boards as they embark on the gruelling recovery process from the severe injuries. Kilkenny ‘is chomping at the bit’ to start his rehab’ and has pointed to Cork’s Ciaran Sheehan – who he played alongside in the International Rules last October – as an encouraging example of a player who bounced back from a severe injury. “I had the operation Tuesday last week. It was best to let the swelling go down for three weeks and build up the strength in prehab. It went well, the leg feels strong now. “I’m on the crutches now for another week and then I’m chomping at the bit to get into the rehab. Ciaran Sheehan, Ronan O’Neill, Kyle Coney and other lads all around the country who did the cruciate have been in touch. It just shows the community that’s there in the GAA. Kilkenny admits to a level of shock when his worst fears were confirmed after undergoing a scan on an injury that he had thought was only damage to his medial ligament. “I did my medial ligament last year and I thought it was that again. It was innocuous enough and a similar hit. I thought I’d only be out for four to six weeks. But I got the answer from the scan and after a few weeks it kicks in that you won’t be playing for the rest of the year. He hasn’t lacked advice on how to embark on the arduous road to recovery. Dublin teammate Bernard Brogan underwent a similar experience when he was younger and yesterday Kilkenny was swapping cruciate tales with Colm Cooper. Watching on for the season will be one tough challenge for Kilkenny to face. This is his final year eligible to play U21 football and he has to observe from the sideline as Dublin are in action in next Saturday’s All-Ireland semi-final. “It’s my last year of the U21′s so it’s harder to watch them. It would have meant a lot to play against Cavan at the weekened. I’ll stay involved and try to pass on advice to the younger lads especially. Opel GAA Ambassador Ciaran Kilkenny was speaking at the launch of Opel Kit for Clubs 2014 – For every test drive, car service or Opel purchase made through the Opel dealer network, your local GAA club is awarded points that can be redeemed against high quality kit for your club! Log onto opelkitforclubs.com and start earning points today. Dubs Decision: Who can step up to the plate in Ciaran Kilkenny’s absence? Email “'We're nearly in a relationship for the next six months!' - Dubs cruciate victims Kilkenny and O'Brien”. Feedback on “'We're nearly in a relationship for the next six months!' - Dubs cruciate victims Kilkenny and O'Brien”.